About the Book – Gaillard Peck, Jr. 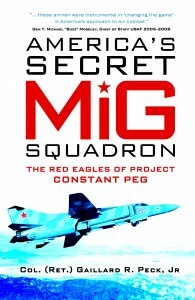 This fascinating unknown history was first revealed in Steve Davies’ acclaimed Red Eagles: America’s Secret MiGs but this book is the insider’s perspective complete with never-before published anecdotes and photographs, revealing how Peck battled bureaucracy and skepticism to ultimately establish the premier fighter pilot training center. Along the way Peck explores many of the central questions surrounding the project: why did the combat Air Forces of the USA find themselves in need of a major revision in their approach to air-to-air combat training? How did they secretly build an airfield to clandestinely conduct air-to-air combat training using actual MiGs as the adversary training platforms? What was it like to be a Red Eagle pilot or maintainer and what were the major challenges they faced on a daily basis? What did the USA get out of the program in terms of a return on investment? Was it worth it and where do we go now?